Forget those expensive multi-vitamin pills and unappetising health drinks — the secret to a long and healthy life could lie in a humble bowl of nuts. New research has shown that people who regularly snack on peanuts, Brazils and pistachios live longer than those who don’t, even when all other factors are taken into account. And for once this wasn’t some flaky study carried out on 12 laboratory mice, but a 20-year investigation into the lifestyles of more than 119,000 people. It showed that those who snacked on nuts seven times a week were a fifth less likely to die during the period of the study. 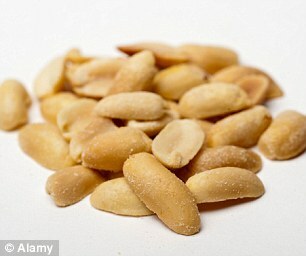 For people who ate nuts only once a week, the fall in mortality rates was still an impressive 7 per cent. Nutrition experts and doctors tend to shun the word ‘superfood’ — they prefer to talk about healthy balanced diets. But nuts are about as close as you get. They are packed with cancer-fighting antioxidants (molecules which help the body fight disease and protect cells from damage) and are loaded with essential minerals such as copper, zinc, iron, magnesium (which help protect against memory loss and with the prostate) and manganese, which are all needed for organs to function effectively. They are an exceptionally good source of vitamins E and B, and ooze omega 3 fatty acids (which control levels of stress hormones such as adrenalin). While nuts are fatty, they mostly contain ‘good’ fats which can — in moderation — reduce the risk of strokes and heart disease. And because they are high in fibre, they tend to fill you up more than nibbling on a box of chocolates. Each nut has its own advantages. 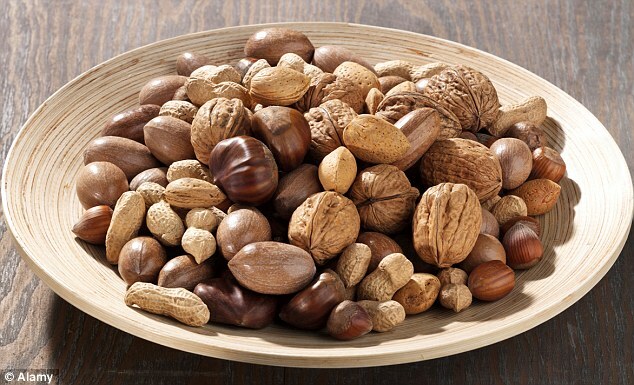 Some nuts are higher in vitamins, others higher in omega 3. Sioned Quirke, of the British Dietetic Association, recommends eating a regular portion of mixed nuts to get the full range of health benefits. 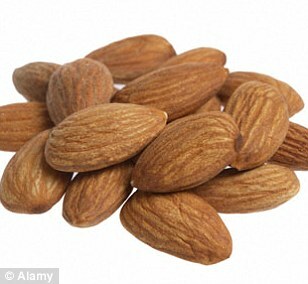 She also suggests eating the skins of nuts like almonds to get the most benefit because they are dense in nutrients. ‘A portion is around one ounce or 30g, which looks like a golf ball,’ she says. So which nut is top in the health stakes? 1oz/28g (20 to 25) nuts — 163 calories. Best for: Fibre, calcium, riboflavin (B2) — the B vitamin that’s good for the skin — and vitamin E.
Good for: Protein, iron, magnesium, potassium (vital for a healthy nervous system), zinc (good for immune function), the vitamin niacin (which helps keep good skin) and copper. Packed with calcium, almonds are brilliant for strong, healthy bones and teeth. They are the best source of protein of all the proper nuts, have the most fibre and are highest in vitamin E — the nutrient that’s good for the skin, eyes and immune system. Almonds are relatively high in calories — second only to macadamias — but are recommended to help people diet. Indeed, a study in the International Journal of Obesity showed that people who regularly ate almonds shed more pounds than those who didn’t. The downside is they can be tricky to digest. Soaking them overnight in water or milk helps. 1oz/28g (6 to 8 nuts) — 186 calories. Best for: Selenium (a mineral vital to fighting disease and healing wounds) and magnesium. Good for: Protein, fibre, calcium, potassium, zinc, vitamin E.
Higher in calories than many other nuts, making them a good source of instant energy for athletes. Technically they are a seed, not a nut, while most don’t come from Brazil any more, but Bolivia. Just one contains your total recommended value of selenium, which is also thought to boost male fertility and may help prevent prostate, breast and bone cancers. Brazil nuts may also help people with thyroid disease. But you don’t want too many. 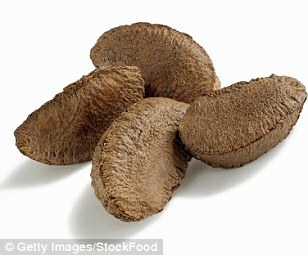 Extremely high doses lead to the loss of hair and nails, so a limit of three or four Brazil nuts a day is sensible. 1oz/28g (16 to 18 nuts) — 163 calories. Best for: Iron and zinc. Good for: Protein, magnesium, potassium, vitamin B6, folate (a natural food form of the supplement folic acid, which is particularly important for women of child-bearing age), vitamin E, omega 3. 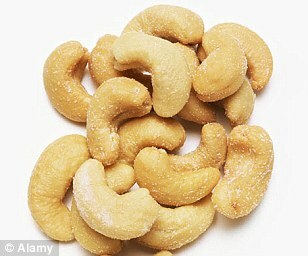 Cashews are particularly rich in iron and zinc. While zinc helps the immune system, iron helps the blood transport oxygen around the body. They have a lower fat content than most nuts — and most of that fat is oleic acid, the heart-healthy substance found in olive oil. A handful of cashews contains almost a quarter of the recommended daily intake of magnesium which also helps turn the food we eat into energy and is good for the bones. The nutrients in cashews may also help with the formation of collagen in the skin. 1oz/28g (20 nuts) — 178 calories. Best for: Flavour and all-round health. Good for: Protein, fibre, calcium, iron, magnesium, potassium, zinc, thiamin, vitamin B6, folate and vitamin E.
Not only one of the tastiest nuts, they are one of the healthiest. High in mono-unsaturated fats, they can help protect your heart and improve your blood health. They are also rich in vitamin E, which boosts skin health, and oleic acid — the fatty acid which can also help reduce blood pressure and may even help prevent dementia. A serving of one ounce contains nearly a tenth of the recommended dietary intake of fibre, a good dose of protein and 17 per cent of the recommended intake of folate — making them a good choice for expectant mums. 1oz/28g (10 to 12 nuts) — 204 calories. Best for: Thiamin (vitamin B10). Good for: Fibre, iron, niacin, omega 3, calcium and potassium. 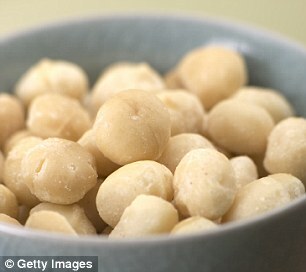 By weight, macadamias are one of most fattening of all the nuts. But much of those calories are in the form of mono-unsaturated fats which can help reduce bad cholesterol levels and lower the risk of heart disease and stroke when eaten in moderation. The nuts — which originally grew in Australia, but which are now produced around the world — are a superb source of omega 3 fatty acids which protect the heart. However, they can be rich. Some digestive systems will struggle with more than nine or ten at a time. 1oz/28g (28 nuts) — 166 calories. Best for: Protein, niacin, folate. Good for: Fibre, iron, potassium, zinc, riboflavin (vitamin B2), vitamin E, niacin (vitamin B3). It may be the most popular nut, but the peanut is technically not a nut at all — it is a legume like a pea, bean and lentil and grows in small bushes a foot above the ground. Peanuts are fantastically good for you, as long as you don’t suffer an allergy. They have the same levels of cancer-busting antioxidants as those found in strawberries. They are high in the ‘good’ mono-unsaturated fat and are an excellent source of protein. However, many of the heart health benefits are wiped out if you eat them smothered in salt. 1oz/28g (20 halves) — 201 calories. Best for: Sterols (linked to lowering cholesterol). Good for: Fibre, zinc, Vitamin E.
Pecans are one of the most heart-friendly nuts, high in sterols that can reduce cholesterol. Sterols are the natural ingredients added to cholesterol-lowering margarine. 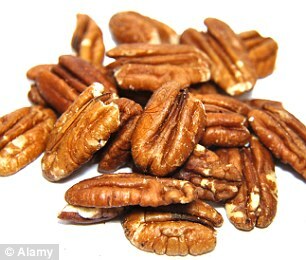 A study in the Journal of Nutrition found that pecans can reduce ‘bad’ cholesterol levels by up to 33 per cent. They are a good source of vitamin E, oleic acid — which is also found in avocados — and are rich in vitamin B3, a nutrient which helps us get energy from food. 1oz/28g (50 nuts) — 160 calories. Best for: Potassium and vitamin B6. Good for: Protein, fibre, calcium, iron, thiamin (vitamin B1) and vitamin E.
The least fattening of all the nuts, a single pistachio has just four calories. Pistachios have three times the vitamin B6 — the nutrient that helps convert energy to food and form haemoglobin —– than any other nut. One serving has fifth of the daily recommended amount and three grams of fibre, more than many fruits. The high Vitamin B6 levels can help women keep their hormones balanced. It’s not just women who benefit, though. 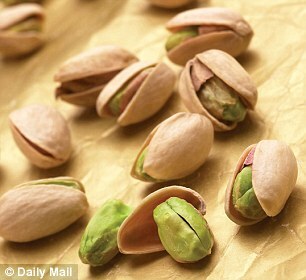 In 2011 a study suggested that daily pistachios could even help men suffering from erectile dysfunction. A serving has as much potassium as half a large banana. Pistachios are also rich in the antioxidant gamma-tocopherol, thought to protect against cancer and heart disease. 1oz/28g (14 halves) — 185 calories. Good for: fibre, calcium, iron, zinc, vitamin B6, folate, omega 3 fatty acids. Packed with omega 3 fatty acids, which can also protect against heart disease and strokes. 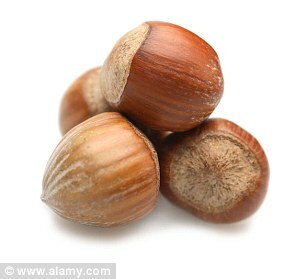 And they have more antioxidants than almost any other nut, making them useful in the battle against cancer. Studies have shown walnuts can reduce bad cholesterol levels. That is because around three quarters of their fat is mono-unsaturated — the healthier form of fat. 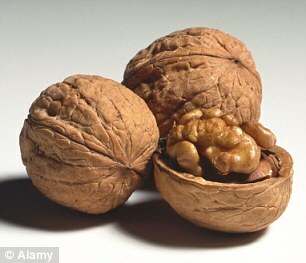 However, once cooked, walnuts lose most of their health benefits. And, of course, a chocolate walnut whip will probably do more harm than good.